South Africa, 29 January 2018: Boschendal has started the 2018 awards season with a sparkle. 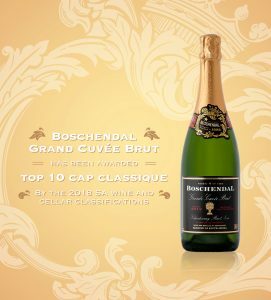 The estate’s Cap Classique Grande Cuvée Brut has been named one of the Top Ten Cap Classiques by South African Wine & Cellar Classifications for the ten year period of 2008 to 2018. The competition investigates wines’ track records across 30 local and international forums in terms of quality and interest value over the last 10 years. To earn a coveted spot in the Classification, wines must have very good to excellent reviews from one or more of the top judging panels during the decade-long review period. Judges include experts appointed to exceptional panels around the world – including the Decanter World Wine Awards, the International Wine Challenge, Platter’s SA Wine Guide and Michelangelo Awards (SA). Gerber says that the meticulous maintenance of the vineyard, coupled with a rigorous grape selection procedure ensures the level of quality expected from a Boschendal MCC. The vinification process is time intensive, with the addition of the liqueur de tirage – the part of the wine blend that contains the yeast – catalysing the second fermentation that results in the magical MCC bubble. A 36 month-maturation secures the flavour, balance and seamless finish.